Looking for information about GSD Enhancements implemented in 2018? To support the enhancements, FICC is updating guides, webcasts and other learning resources on the learning center. Watch this space for announcements about these updates in the near future. Updated 7/25/2018: The GSD Risk Reporting Guide (RTTM Reports) is meant to help members understand the reports available to them within the RTTM® Report Center. Within this document we present and describe Clearing Fund related reports, define their line items and provide an image of each report for reference. You may also find this document in the Documents tab at the top of this page. Welcome to the Government Securities Division (GSD) section of the Learning Center! The GSD Learning Center is designed as an educational resource to better equip Fixed Income Clearing Corporation's (FICC's) Government Securities Division (GSD) Netting Members and stakeholders with the tools needed to best use GSD's services. US Government Securities is the largest sector of the fixed income market. 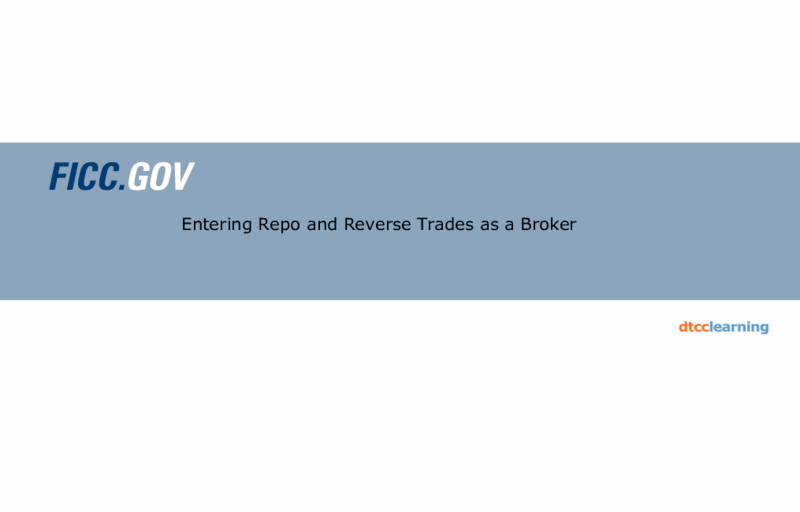 The GSD acts as a CCP providing clearance, settlement and risk management services to its’ Netting Members in the U.S. Government Securities market. In addition to Netting Member services, GSD services another category of members known as Comparison-only members. GSD’s comparison services for Comparison-only members, does not include netting or settlement services for their trades. 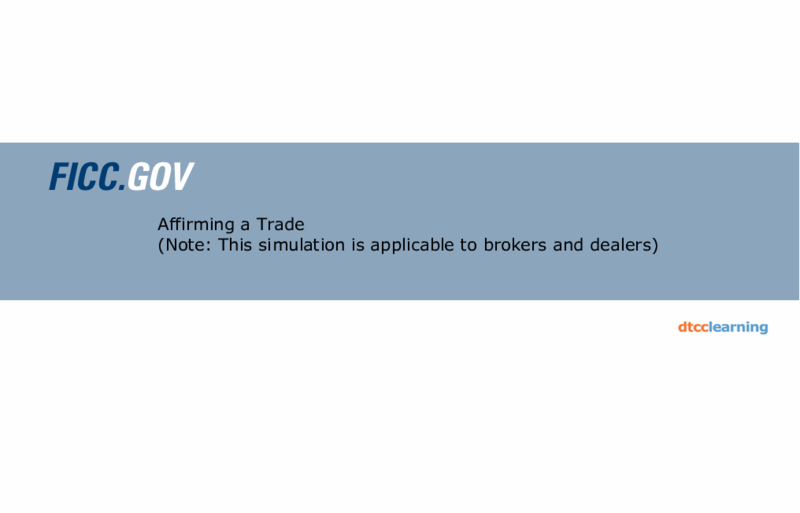 Participating members include banks, Inter-Dealer Brokers (IDBs), dealers, Government Securities Issuers, Foreign Persons and Registered Clearing Agencies who meet GSD’s membership requirements. 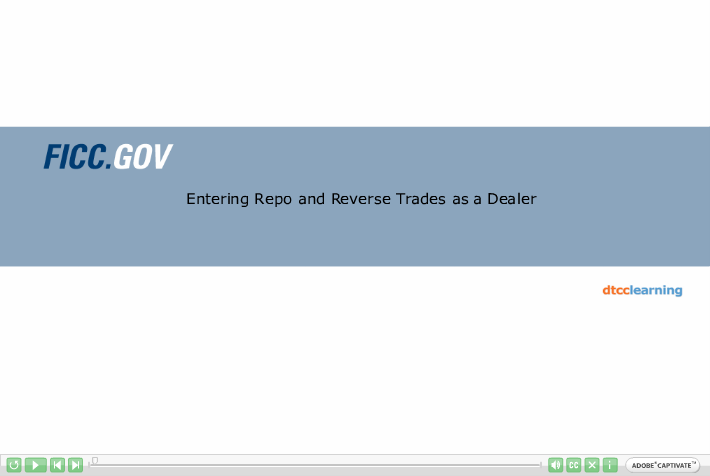 Currently GSD supports two primary products, Delivery vs. Payment (DVP) and GCF Repo®; GSD processes several types of transactions including buy/sell trades of U.S. Government securities, both dealer to dealer and broker to dealer Repos including overnight, forward-start and term Repo trades, Treasury Auction Takedown trades and GCF Repo® transactions. Fixed Income Clearing Corporation (“FICC”) would like to remind the Government Securities Division (“GSD”) and the Mortgage Backed Securities Division (“MBSD”) member firms of the guidelines that should be followed in the event that they are experiencing internal system issues and require an end-of-day extension to submit trade input. In the event that members are experiencing system issues and require an extension beyond the 8:00 p.m. EST cutoff, please contact the IT Operations Group at 888-382-2721 (option 5-5). Members must contact the IT Operations Group by 7:30 pm EST to request a trade submission extension. Any request received after 7:30 p.m. EST will be handled on a best efforts basis. Upon request by a member, an automatic extension will be granted for a period of up to 30 minutes through 8:30 p.m. EST. If a member requires an additional 30 minute extension through 9:00 p.m. EST, FICC Operational staff may request additional information (i.e. volume, system status, etc.) in order to assess the request. If FICC Operations agrees to grant an additional 30 minute extension through 9 p.m. EST, an email notice will be sent to all members alerting them of the delay in the transmission of end-of-day output beyond typical distribution timeframes. FICC will send status update alerts to member every 15 minutes thereafter with the estimated timeframe for publishing the end-of-day data output. The FICC Government Securities Division (GSD) has implemented a number of enhancements as of June 25, 2018 to benefit Members. GSD invites you to view a few short videos created to acquaint you with the enhancements, why we’ve implemented them and how they will benefit you now and in the future. Look for additional videos in this series, coming soon! To learn more about GSD products and services, please select a topic that you would like to learn about from the menu located to the left of this article. What are Negative Rate Yields? This simulation is designed to help you navigate through the process of accessing reports in Report Center. This simulation is designed to help you navigate through the Dealer Login Home Page. 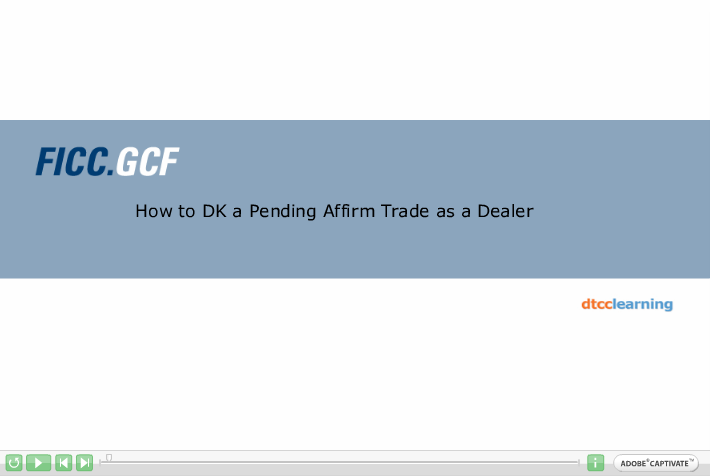 If you are interested in learning more about FICC's GSD Netting Member benefits, check out this video. This simulation is designed to help you navigate through the process of modifying a GCF Repo® Trade as a Dealer. This simulation is designed to help you navigate through the Dealer View Overall Position Monitor screen. This simulation is designed to help you navigate through the Broker View Overall Position Monitor screen. This simulation is designed to help you navigate through the process of modifying a GCF Repo® Trade as a Broker. This simulation is designed to help you navigate through the process of entering a GCF Repo® Trade as a Broker. 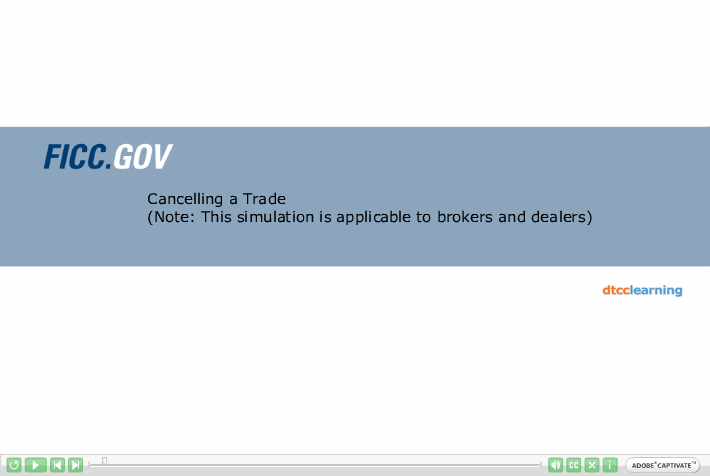 This simulation is designed to help you navigate through the Broker Login Home Page. This simulation is designed to help you navigate through the Login Home Page. This simulation is designed to help you navigate through the the Obligations Query screen. This simulation is designed to help you navigate through the Advisories Split-View Query screen. This simulation is designed to help you navigate through the process of searching for a DVP Trade. This section provides a central location for all the GSD related FAQs and their answers as found throughout the Government Securities Division (GSD) section of the Learning Center. To view most of the FAQs in this section you must first be logged in.